We?ve been here before, confronting this question of children?s art, and why it creates such a stir. I wrote about it in May 2006 when Brandeis University cancelled an exhibit of Palestinian children?s art. This cancellation seems even more egregious because the museum in question is specifically a children?s museum. Who objects to children?s art in a children?s art museum? And, what should we make of a children?s museum that allows the concerns of those constituents to censor the views of children, denying their right to expression? I?m talking about the Oakland Children?s Museum (MOCHA) and its decision to cancel the exhibit A Child?s View of Gaza, which was to have opened there this week, on September 24. One can only conclude that those who have objected to this exhibit are troubled by the content. For whatever reason they want it buried, out of site and out of mind. They must be a powerful group. They succeeded in convincing the museum?s board to ignore its stated goal of ?…advocating for the arts as an essential part of a strong, vital and diverse community?. And, they have put the museum in the uncomfortable position of denying Palestinian children their rights as guaranteed by Article 12 of the UN Convention on the Rights of the Child (CRC): the right of every child to express his or her views and to have those views given due consideration. ?The artist’s job is to be a witness to his time in history.? said the artist Robert Rauschenberg, and so it is with our young artists. Seeing, as we know, comes before words. A child looks and recognizes people, places and things before she or he can speak; ?views? are developing from the moment of birth. So, imagine the views taken in during the long, wide-eyed hours of childhood in Palestine or in Baghdad on in Afghanistan. Imagine the tension, worry and preoccupation on the faces of the adults; imagine the looks on the faces of the of soldiers as they patrol the streets, or search homes. Imagine the hundreds upon hundreds of violent scenes that could and do play out in front of children living in war zones. This is their world. It surrounds them day in and day out. And oftentimes, they have not only no words, but no opportunity to tell us what they think and feel about this. Taking crayon or pencil in hand, a child speaks out on his or her own behalf: this is me, my situation, this is what my life looks like. It isn?t easy for adults to bare witness to these stories. I?ve seen exhibits of children?s art from Hiroshima, from Spain during the Civil War, from Viet Nam, from Darfur, from the concentration camps in WWII and from Iraqi children. What we see in some of this art is the human cost of war, the terror and agony of being a child in an unpredictable, dangerous and violent world, a world gone inexplicably mad. A world where you are not safe, where even your parents cannot protect you. This art is not about politics, it is about the human condition. If we cannot look at it, if it is too painful, it is because the world we have created, full of violence and conflict, is not one that is good for children. The famous 60?s poster with one giant flower said it all: War is Not Healthy for Children and Other Living Things. We have a legal as well as a moral obligation to let Palestinian children, and all children express their views freely and to give those views our due consideration. If we are disturbed by children?s images from war zones, we should work on their behalf to create a better, more just and peaceful world , a world where children are truly valued and where their care, protection and overall well being is a social, economic and political priority. To do anything less is to deny the significance of children as the future of our planet. Aldous Huxley wrote this, in his introduction to ?They Still Draw Pictures! A collection of 60 drawings made by Spanish children during the war? (1938): The most that individual men and women of good will can do is to work on behalf of some general solution of the problem of large-scale violence and, meanwhile to succour those who, like the child artists of this exhibition, have been made the victims of the worlds collective crime and madness. The museum, in canceling the exhibit has dealt yet another blow to children and their rights; surely a children?s museum, of all institutions, can do better than this. Claudia Lefko is the founding director (2001) of The Iraqi Children’s Art Exchange in Northampton MA. She is a long-time educator, activist and advocate for children. 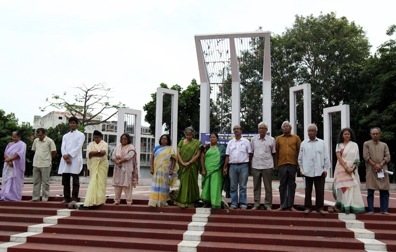 Pathshala – South Asian Media Academy was established in Dhaka in 1998 to fulfill the long felt need for providing institutional education in photography in Bangladesh. Today Pathshala is one of the premier institutes of photography in Asia. With a visiting faculty consisting of the finest professionals in the world, the school boasts a teaching programme that is second to none. Students have won major international awards (World Press Photo, Asahi Shimbun, National Geographic All Roads Contest etc.) and take on assignments for the most prestigious international publications (Time Magazine, Newsweek). Within a short period, Pathshala has established itself as a regional centre for excellence in photography, attracting students from India, Nepal, Norway, Denmark, Pakistan, Singapore, South Africa, the UK and Zimbabwe. Pathshala is affiliated to Bolton University (UK), the Danish School of Journalism and Sunderland University (UK). Three years professional course on photography. For more information please see, www.pathshala.net. Internationally renowned Bangladeshi photographer, writer and activist Dr Shahidul Alam will lead a free public discussion next week, hosted by The University of Queensland?s Centre of Communication and Social Change, School of Journalism and Communication. Dr Alam will discuss the role of ?the visual? in communication for social change at the James Birrell Room of the UQ Staff Club on Tuesday August 23 at 5.30pm. Who: Internationally renowned Bangladeshi photographer, writer and activist Dr Shahidul Alam. What: Public lecture on the role of ?the visual? in communication for social change. When: Tuesday August 23 at 5.30pm for a 6pm start. Where: James Birrell Room of the UQ Staff Club, The University of Queensland.